It’s just as if viewers are inside an actual property – walking from room-to-room, turning around, stepping closer or farther away. They can use a male or female avatar to navigate around, or fly above the property to get a true feel for the overall layout. It used to take a team of skilled animators, plus thousands of dollars, to create stunning 3D walkthroughs of properties. Now you can do it with just a click of a button in RoomSketcher! No downloads or technical training is required. RoomSketcher home design software is user-friendly, easy-to-use and online, so you can access your design projects anywhere, any time! Visualizing Interior Designs. Use Live 3D while you design – visualize floor and wall coverings, try various furniture styles and sizes, move walls or windows, and so much more. Then take your clients on virtual tours, helping them visualize, gain a greater comfort level, and easily choose between design options. You can even share interactive project links, so clients and contractors can review the project in Live 3D from any of their devices, without having to be at the property. This makes phone meetings possible and more productive, improves review and response time & reduces misunderstandings and costly mistakes due to difficulty visualizing. Selling Property. Potential homebuyers love to virtually tour properties (especially if they live far away) and this allows them to truly visualize the space, and even try out remodeling ideas or placement of their furniture. Marketing a New Home Development. Clients can tour (and fall in love with) model homes from their computer or mobile device, before any building has started! 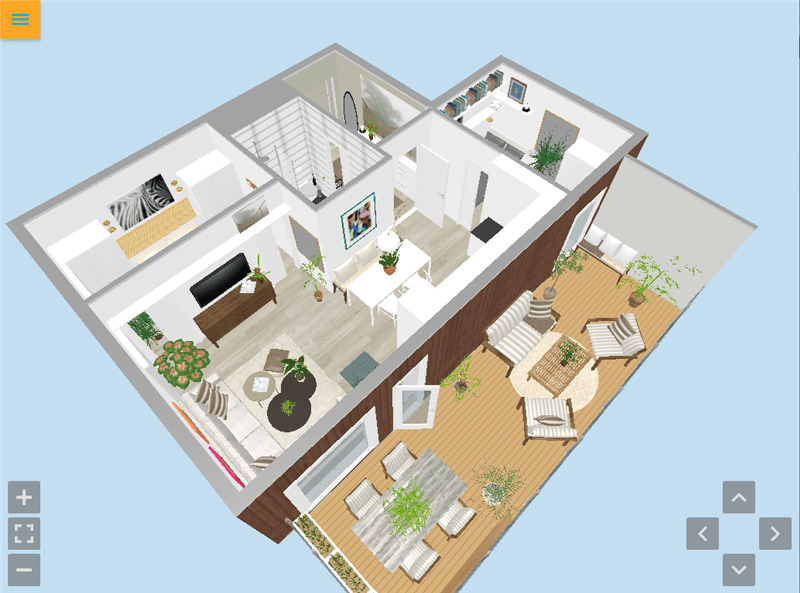 Live 3D Floor Plans also help clients visualize home customization options such as flooring, paint colors, or appliances. Home Improvement Contracting. Contractors and Kitchen & Bath Specialists use Share Live 3D Floor Plans to better illustrate projects for their clients. Since these specialists are often on-the-go, they appreciate the ability to Share Live 3D Floor Plans from their mobile devices. Visualizing Home Renovations. Homeowners can virtually move walls, add windows, try out paint colors, and use Live 3D to truly see how it will all look. Then, use Share Live 3D to better communicate final ideas to Home Improvement Specialists. Good communication improves estimates and avoids costly mistakes. RoomSketcher VIP and Pro users have Live 3D available for all projects. Any RoomSketcher user can view a project in Live 3D if they enable Share Live 3D Floor Plans for a project. Best of all, you just click a button to view your project in Live 3D! Open RoomSketcher Home Designer. You can draw floor plan projects yourself or order Ready-Made Floor Plans to have RoomSketcher Illustrators create the project for you. Simply click the 3D button at any time to instantly view your project in Live 3D. In RoomSketcher My Account, click Projects, then click a Project Name to open the Project Dashboard. Under Share Live 3D Floor Plans, you’ll either see your sharing links, or an Upgrade to Share button. If so, click Upgrade to Share. – RoomSketcher 3D Walk. This link allows users to experience your project in Live 3D, either from their personal computer, or from their mobile device. – RoomSketcher Home Designer. This link allows users to experience your designs in Live 3D, plus make changes and customizations to their copy of the floor plans, using Home Designer’s user-friendly drag-and-drop interface. Simply copy and paste a link, for example into an email message. Or embed it on your web site. Your user just clicks the link – there is nothing that they need to download.